The Italian Political Science Association (SISP) supports and encourages cooperation in research and training among individual political scientists in Italy and cross-nationally, by promoting scientific activities in all sectors of Political Science. The PS Italian association’s website provides a relevant amount of general info concerning the discipline in Italy for teaching (courses, syllabi), research (projects, opportunities, conferences, PhD programs, research centres), and scholarly contacts (members directory, contact details and research interests, publications and projects in details for each member). Research materials are also available, mainly proceedings of the annual conference and other papers provided by the members or related research institutes. Link lists to external pertinent online research resources are also provided (other associations, databanks, publishers and journals, etc.). Access to all materials is completely free and open for all users, as well as browsing, search and downloading. The website architecture is very intuitive and simple. 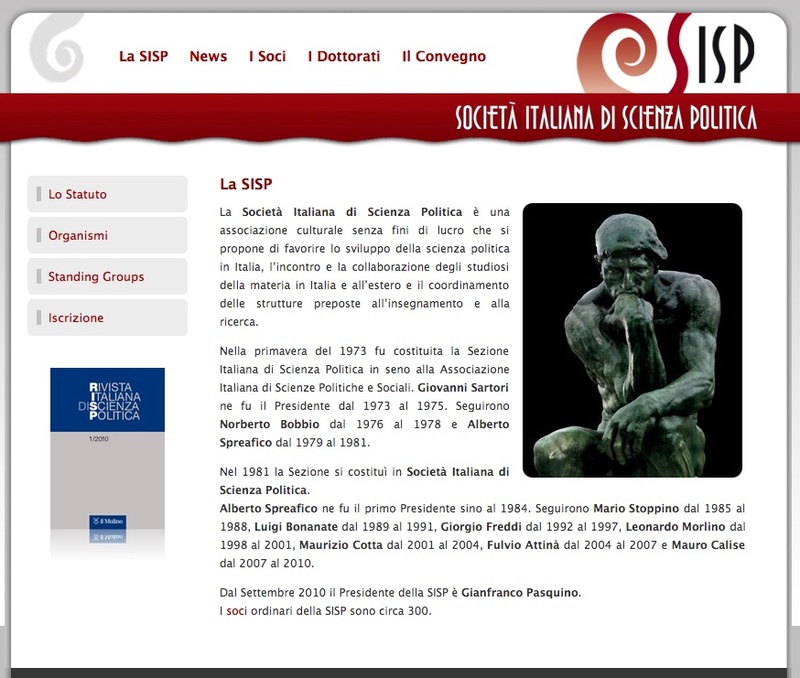 The SISP website is in Italian and only a limited part of its pages are translated into English.